Glenmorangie Signet was launched in 2008. It is arguably the most unique expression in the range. It is a marriage of whiskies produced from a single estate Cadboll variety and roasted chocolate barley (about 20%), the latter is usually associated with heavy dark beers like porter and stout. 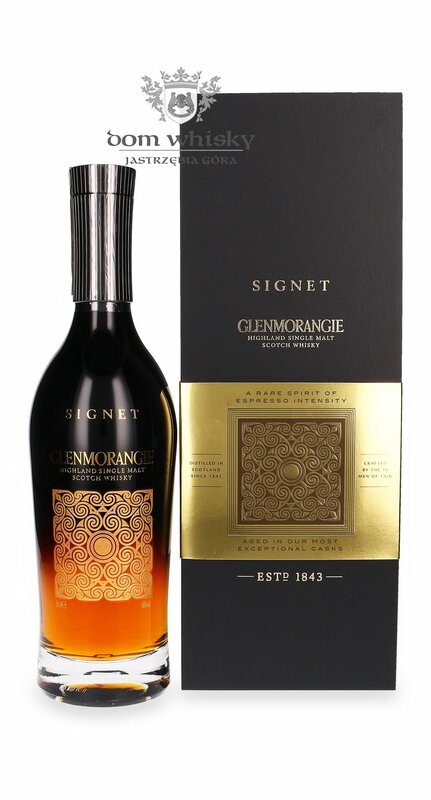 While Signet carries no age statement it contains some of the distillery oldest stock aged for over 30 years. The chocolate malt whisky in the vatting is about 10 years old. The whisky takes its name from the ornate square design that adorns most Glenmorangie bottles – a 9th Century stone carved by the ancient civilization (the Picts) that then ruled northern Scotland. Glenmorangie Signet scored several medals and awards most recently Gold at the 2017 International Spirit Challenge. Nose: rich, dark chocolate, coffee beans, raisins, hazelnuts, prunes, bitter orange marmalade, golden syrup, toasted sesame seeds, hints of tobacco and oak. Palate: rich and elegant, chocolate truffles, espresso, orange zest, honey-roasted almonds, dried dates, prunes, caramel, cinnamon, hints of vanilla and tobacco. Finish: long, with notes of dark chocolate, dried berries, bitter oranges, oak and tobacco.